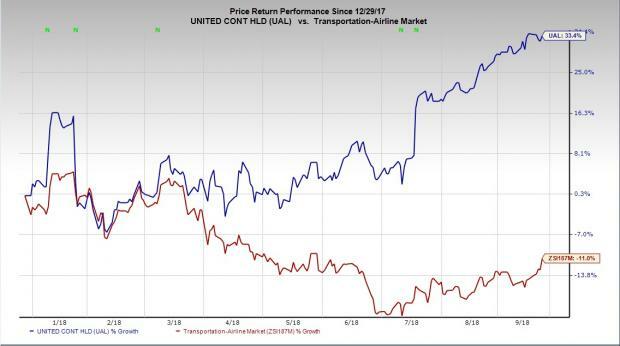 Shares of United Continental Holdings, Inc. UAL have surged more than 33% so far this year against the industry’s 11% decline. Let’s delve into the factors which led to this upsurge. The company provided a bullish third-quarter 2018 guidance at the Cowen and Company 11th Annual Global Transportation Conference on Sep 5. The carrier now anticipates third-quarter consolidated passenger unit revenues at the high end of the past guided range of 4-6% increase. Also, it expects pre-tax margin excluding special charges and the mark-to-market impact of equity investments in the high end of the earlier estimate of 8-10%. The impressive unit revenues and pre-tax margin predictions despite rising fuel prices certainly signify a big upside. Notably, the carrier has been making efforts to offset the negative impact of high fuel costs. To this end, it recently increased fees for checked baggage. The carrier now charges $30 and $40 for checking the first and second bags, respectively. The earlier charges were $25 for the first bag and $35 for the second. This elevated fee structure, effective Aug 31, is applicable on flights operating on the North American, Caribbean and Central American routes. Apart from United Continental, other major U.S. carriers like American Airlines Group Inc. AAL, JetBlue Airways Corporation JBLU and Delta Air Lines, Inc. DAL have announced baggage fee hikes on the same ground. Thus with several U.S. carriers engaged in the baggage fee-hike activity, the U.S. Congress had initially planned to reauthorize the Federal Aviation Administration to regulate the airlines’ current fee structure pertaining to baggage and ticket change prices, in case the fee policy was found unreasonable to passengers’ interest. Ending the uncertainty, the Congress recently changed its mind to control the same. However, it has included certain rules in favor of passengers’ interest. Some directives include setting a specific dimension for passenger seats with sufficient legroom and width as well as forbidding airlines from removing passengers from flights on clearing the boarding gate. The Congress’ decision not to impose regulatory measures on airlines is a huge positive for the industry players. Notably, the U.S. airline industry generated approximately $7.5 billion revenues from baggage and reservation change fees last year compared with $5.7 billion in 2010. Had the regulation been levied, the airline companies’ top-line growth would have been significantly hampered. Coming back to the company’s upbeat projections, not only are its third-quarter estimates encouraging, its full-year forecasts are equally promising. The company expects adjusted earnings per share in the $7.25-$8.75 band for 2018, higher than the previous outlook between $7 and $8.50. Owing to this positivity, the Zacks Consensus Estimate for current-quarter earnings has been revised 8.3% upward over the past 60 days. Further, the same for full-year earnings has been moved 3.8% north in the same time period. Each stock mentioned above carries a Zacks Rank #3 (Hold). You can see the complete list of today’s Zacks #1 Rank (Strong Buy) stocks here.